We are pleased to announce our latest project that we have worked on with East Hampshire District Council (EHDC). 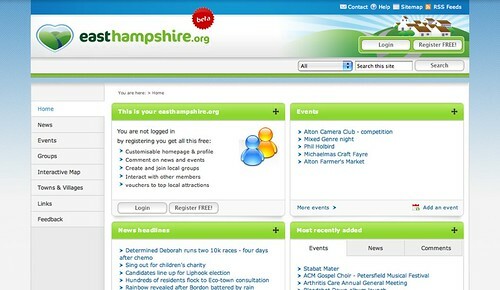 easthampshire.org is a community site which features daily news updates and an extensive event listings of what’s happening in and around the the East Hampshire Area. Also interactive maps, and information on towns and villages in East Hampshire. This is not the main portal site for EHDC as you may think, but a companion/sister site that has features that are useful for anyone wanting to learn more about the East Hampshire area. You don’t have to live in East Hampshire to be able to appreciate that in a traditionally rural area so much is happening. Furthermore, you don’t have to register to enjoy the wealth of information constantly being added to the site, however, to get the customisable and personalised features that the site offers you can register for free. EHDC want the site to be a hub for community information with free pages for groups, customisable profiles, and links to other local websites. As you can visit the site and learn about the area, also the people that feature on the site. We hope it wil draw people closer together in this rural county. It features content generated by members on the site, as well as featuring social networking features such as member profiles, being able to comment on various sections of the site. As the site grows from visitors generating content as well as the EHDC team publishing content, it means that for the first time a two way dialogue on-line can be created on a local government site. Visitors to the site can learn from a number of interesting sections on the site – news, events, towns and villages, and local groups. You can pinpoint the news for example down to street level – using geo-coding and Google maps on the interactive map, something that has not been done at this level before by a council run site. All visitor’s to the site have the opportunity to submit their own news or event item, which is moderated by the EHDC team and then published on the site. As a group admin, a club secretary for a local club or group – for example, the Greatham Gardeners club group, they can add events automatically to the site, using a form that sends their details directly to Yahoo Upcoming. This information is then pulled back into the site, and featured on their group page. Allowing all visitors to learn about the group, and possibly attend the event. As part of this ‘add event’ feature the person entering details into the form can geo-code the event, as well as ‘tag’ the event – meaning the event is shown on various parts of the site at the same time, as well as being featured on upcoming’s service. For example view the event for “Plants and Gardens of the Italian Lakes at Greatham Village Hall” on easthampshire.org, listing detail, map detail and the same listing on upcoming. The site is quite innovative in the way it uses already existing web services to do the work for us. Why create something that is already working and proven? We have integrated social elements in the site using the API’s of Yahoo’s upcoming, del.ico.us, and Google Maps. We also have geo-coded events and news items, so users can get driving directions for events, for example. And also find out where exactly that news item is referring to. The events all feature hcalendar using microformats. With the correct coding we have structured the event listing so that that search engines and other aggregators can retrieve such events, automatically convert them to iCalendar, and use them in any iCalendar application or service, such Google calendar. Although not a social feature, we have added OpenID to the site, so users don’t have to remember their username and password. With OpenID, it means that users can log on to different web sites using a single digital identity, single sign-on. This relates to data portability and means that you don’t have to remember all those different passwords for each website account. The main aim is to let people be creative and pull their information from various sources on this site, as well as external sites. By choosing which town or village you are interested about during registration, boxes featuring events and news based on your choice will automatically appear on your homepage. There is a ‘netvibes’ style homepage where you can move the boxes around the page depending on your preference. You can also choose which boxes appear. As well as having your delicious bookmarks on your easthampshire homepage. The RSS page means users can be updated by using their RSS reader on new details on any town or village in East Hampshire. We’d love to hear your feedback either on here, or directly on the site. Is this the future for council sites that are embracing current and future web technologies? We hope this will attract some attention from other community sites, and set new standards in how councils can communicate with member of the public. The site is still in beta and we have more interesting features planned for the site planned, early 2009. Watch this space!